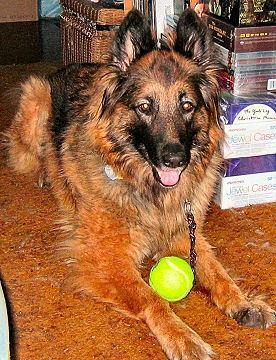 SABLE entered our lives in mid-April, 2015, when Marlene Henry of Seal Beach, California, whom we had met via Drew's website fifteen years before -- and who is the only visitor to the website who ever traveled 1,000 miles to dine with Drew at the Berlin Inn (see "Drew's Friends") -- alerted us to a striking Long Haired German Shepherd which had just appeared on the website of what many believe to be the premier German Shepherd Rescue in the entire country, Westside German Shepherd Rescue, near the University of Southern California, in Los Angeles. 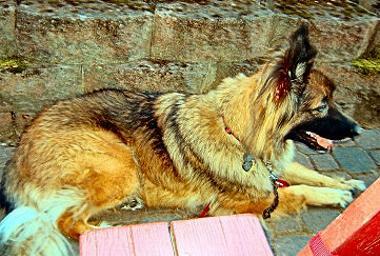 That was our first glimpse of the dog they had temporarily named "Darina von Dassow", and whom we now call Sable. Later the same day we submitted an application to adopt her, and after two long interviews and scrutiny of our home, yard, and background, we were granted the adoption. 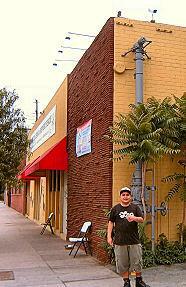 Eric flew to Los Angeles, two days after family friend Mike Sullivan had driven our car to Los Angeles, and together we completed the paperwork and took off northbound on Interstate Five for the thousand-mile trip back to Portland. Thus the adventure began! The photo above was the picture that Marlene alerted us to. As is the case also with the Westside website, if you click on the picture above you will see the page they built for her, with several more photos, and their description of this sweet and affectionate (and very smart) dog! Sharon Nelson of Westside German Shepherd Rescue shared with us this snapshot of Sable, when she first arrived at Westside from the high-kill shelter that had picked her up running on the streets with no colllar, tags, or chip, and held her for a month waiting in vain for her to be claimed by her owner -- after which she was transferred to Westside, cleaned up, given her shots and vet attention, before being offered for adoption in mid-April of 2015. Sable looked about the same even then, but there was something just a little odd to us in this photo. It was not till more than four months after we adopted her that it struck us what it was: Her body was smaller and shorter than it should have been with respect to her head. As you scroll down the page you will realize, as we have, that she was, here, very much still a growing girl -- and might possibly have been not much over half a year old when this photo was taken, which is much less than either shelter thought she was! 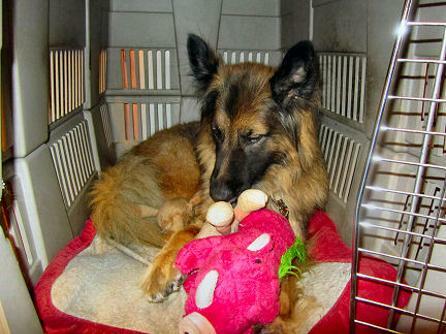 As we arrived at Westside German Shepherd Rescue on April 21, 2015. It's near USC in Los Angeles. 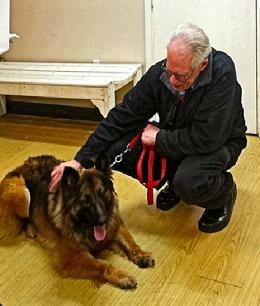 Eric meets Sable for the first time at the front desk of Westside German Shepherd Rescue. She seemed quite amenable to leaving with him and Mike Sullivan for the 1,000 mile drive north to Portland, Oregon! Sable proved to be a seasoned traveler; during the entire thousand-mile drive back to Portland, when the car got up to freeway speed, she lay down in her hammock in the back seat and snoozed. When we stopped for food or gas, up she popped, ready to go. 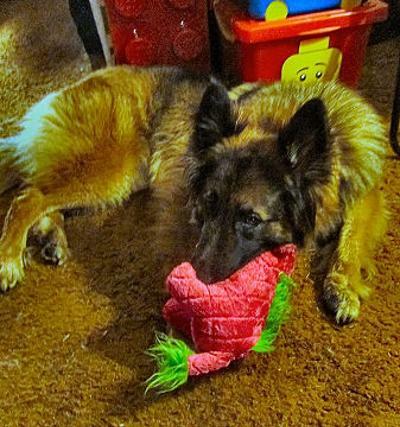 One of the things we were hoping for in a new Long Haired German Shepherd was a distinct personality; we didn't want to compare her to Drew, or to think of her as some sort of clone for our dear, departed Drew. And indeed, Sable is definitely her own dog. Her coloring is different, her personality is different (although she, too, is friendly and people-oriented); and she behaves differently too. Here's just one example. 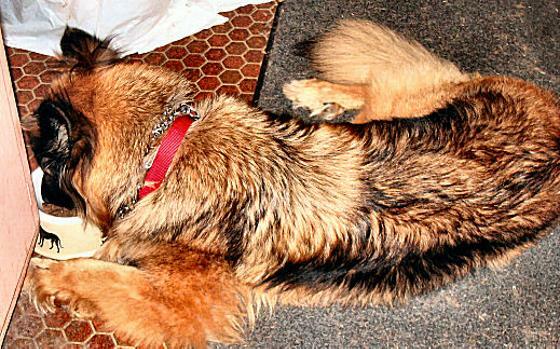 We have never seen a German Shepherd dine in the style of the ancient Romans -- reclining while browsing her dish. We saw Sable do it more than once in her first week with us..... All she needs is the toga! 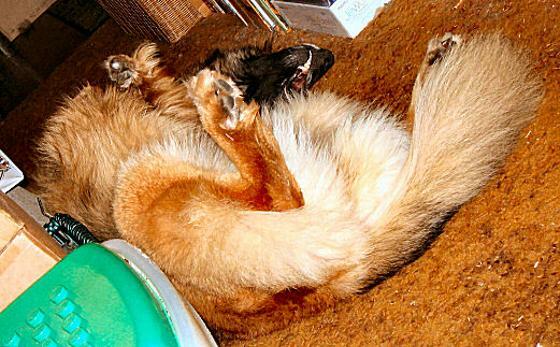 However, we must concede that Sable does a few things we have seen Drew and other German Shepherds do... such as reclining upside down, and in particular in this oddly contorted position with teeth deployed. When Jane saw Drew do this occasionally, every time she was afraid she had died. 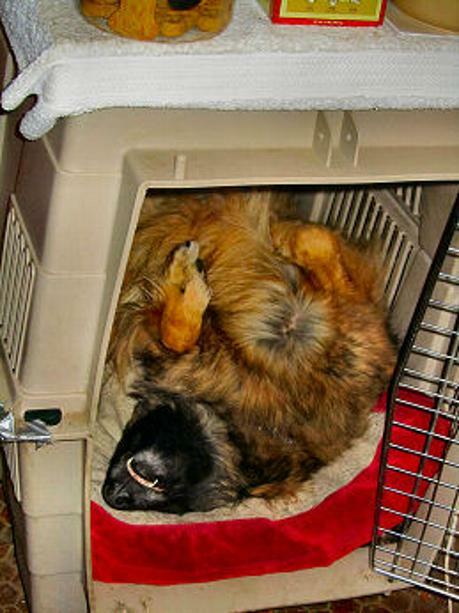 Apparently, this is simply comfort for a German Shepherd! Furthermore, we readily admit that Sable also seems to enjoy the food at the Berlin Inn/Brooklyn House, and in her first visit proved adept at sitting by Eric and sharing food with him, using a fork. 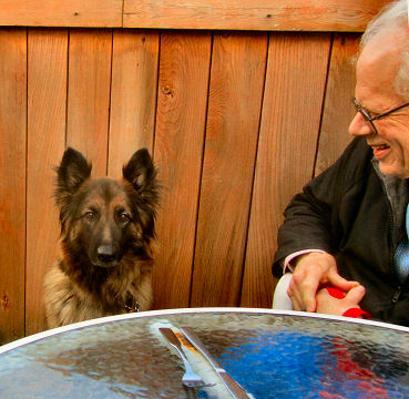 On Friday night, May 1, 2015, Sable sat for the first time at a porch table at the Brooklyn House Restaurant (former Berlin Inn), not yet realizing that where she was, and the fork in front of her, meant that she was about to dine with her new family at this fabled dog-welcoming restaurant in the Brooklyn neighborhood of Portland. 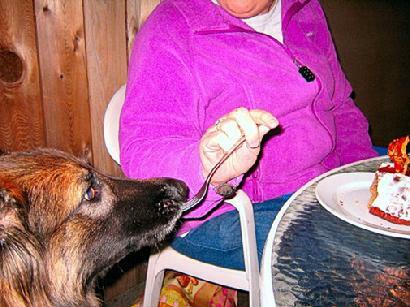 She shared Eric's dinner of German Sausages and Barktoffel Potatoes. She loved it! She'll be back!! Sable, caught in a pensive moment as she munches on her new Warthog toy. She apparently never had a squeaky toy before, and was quite amazed when her first three toys all squeaked when she bit them in the right way. A Kong squeaky ball she got from her masseuse Kim Schwartzenberger enchants her, and she has learned to play it like an instrument! On May 21, 2015, Sable started her second month in the Norberg home. In that first month, she quickly bonded with her new family (it took less than a week), learned and responded immediately to her new name (it took less than two weeks), and went from avoiding her crate in the kitchen to adopting it as her own (that took just over two weeks). Her first exam with her new vet was positive (Dr. Ferro, at Barkley Hills Animal Clinic in Oregon City), and he found Sable's heath good, but he referred us to Dr. Scott Lozier at the regional VCA Emergency Animal Hospital in Clackamas, Oregon, since she limps a bit on her damaged left front paw. (Somehow she's lost three toes, but this was surgically repaired with some expertise, evidently some time before she wound up on the streets of Pasadena, California, in January of 2015.) X-rays confirmed the past repair, but indicated an orthotic appliance would make it a lot more comfortable to walk on that foot, and an appointment was set with Dr. Lozier for impressions to be taken for the manufacture of that appliance on May 23, 2015. She kept the appointment, although she did not like the impressions process very much, and we hope she will wear the appliance when we do receive it. Surprisingly, since Dr. Lozier also found her a bit sensitive in her hips, a further X-ray showed that she has arthritis (but not dysplasia) in both hips, despite her early age, and probably eventually will need hip replacements -- although at present she does not seem to be impeded at all, in her occasional joyful moments of leaping this way and that. We put her on joint supplements immediately. In her first month, Sable has made a lot of friends, gotten used to Eric working upstairs in his office much of the day -- emerging to give her several walks a day, and to engage with her from time to time; has shown she travels very well in a car; has enjoyed several dinners shared with her family outdoors at the Berlin Inn/Brooklyn House and at the local San Felilpe Taqueria; and has attended a two-hour neighborhood association meeting (and behaved very well) when Eric could not get a sitter. She still shows some separation anxiety when we leave her alone in the house for even very short periods of time, so we will have company for her -- one of us, or a sitter when we both are out -- for some time to come, we suspect. She was introduced to Whippy Ball on Memorial Day, May 25, and seemed to take to it immediately -- giving her the best workout she'd had since she joined our family. It did put quite a strain on her damaged left front foot, though, so we have turned subsequently to water therapy to keep her exercised without so much strain on that foot. More on the water therapy below! Sable is fitting in very comfortably and happily into our family, and we are enjoying her company and her delightful personality more and more every day. 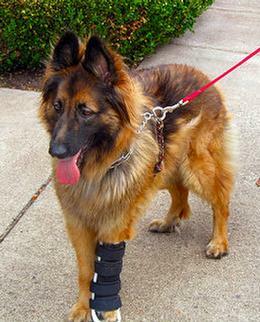 On June 27, Sable was fitted with her new orthotic appliance by Dr. Lozier at the VCA Clackamas Veterinary Hospital. It is custom made to fit her damaged left front foot, and with the gel pad at the bottom, to give her comfort and support. She accepted it immediately and seemed to like walking in it (although she sounds like a peg-leg pirate walking -- clunk, clunk, clunk)..
One thing we quickly learned is that we need to cinch the velcro straps a little tighter! By the time we'd driven four miles to Mike's Drive In restaurant in Milwaukie, Oregon, the appliance was lying on the car seat next to her, still cinched up, and with apparently no effort on her part to remove it! Nonetheless, she didn't limp when she was wearing it, and since she seems to accept it, it should make her more comfortable as she gets around. This is Sable at Mike's. We find there is interest in how Sable accepts the kitchen crate that was home for Drew for most of her fifteen years. Her smell is probably still in the crate and on the mattress -- plus, of course, a rescue dog is probably quite skeptical of crates anyway because they have doors that latch. Well, after she gradually got used to it over her first couple of weeks with us, she seems very comfortable in it -- though if we are available, she seemingly would rather spend time with us than in it. She does spend time in it every day, though, and often sleeps in it at night. "You want me to WHAT..??" Sable's first obstacle was simply getting into the water! But, after several sessions, she has actually gotten in by herself a few times, though not with any enthusiasm so far. She's happier once she is in. Scroll down for a slide show of ten photos from her first session in the water! The photo-show above presents snapshots from what apparently was Sable's first experience, ever, in a pool or tank of water. 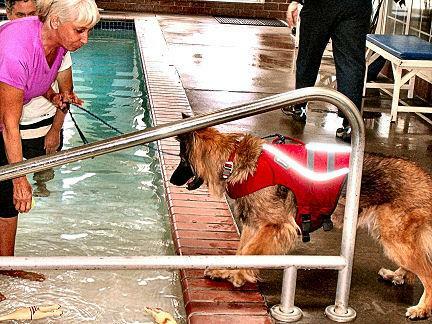 She was not enthusiastic about getting into the pool at Milwaukie, Oregon's, Paws Aquatics -- but its owner Diane Kunkle CVT, CCRP patiently introduced her to the water -- and once she was in, she was a pretty good sport about it. Although at times her course in the pool seemed to be more towards the exit than to the target, she was willing to go after the Kong "squeaky ball" as it was thrown out into the pool, and to bring it back to the side and drop it in front of Jane or Eric (or our friend Mike Sullivan, who was with Eric when we adopted Sable, and who was with us for her first water adventure too). She kept it up for the full 30 minutes before stepping out and spectacularly shaking off. Later, she slept very soundly that night! By coincidence, Sable's first swimming exercise session there followed immediately one with Long Haired German Shepherd Gwendee from Corvallis, with her family John and Hsiou-Lien, who had been co-hosts with us of Drew's last birthday party the previous July, and who can be seen in the photos of that event. It was their first opportunity to meet Sable, and everybody had a good time. Sable's second swim was set for just one week later, and her vets endorse the experience as a way of getting her solid exercise without putting undue stress on her damaged left front paw or her hips. We ended this day with Mike, John, and Hsiou-Lien, joining Jane and Eric and Sable in dining at a sidewalk table at the excellent San Felilpe Taqueria, in Portland's Westmoreland neighborhood. Gwendee was there too, but inasmuch as she is getting on in years and was a bit tired after enjoying her own water exercise, she rested in the car a few feet away during our meal. One of the first things we learned about Sable's tastes, on the occasional opportunties for her to share our dinners when dining out, is that she loves soup. She'll even avidly consume celery and carrots if they come in a savory soup stock. 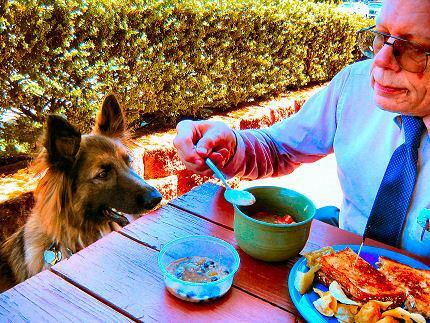 Here, in the first week of August of 2015, at the excellent Beez Holgate Station not far from our house, Eric shares his soup by filling a bowl for Sable, and she waits enthusiastically to savor it! Jane took the photo. For Sable, things are always looking up! That's because she is strangely fascinated by squirrels -- and she knows they are to be found in trees, as well as on powerlines and scrambling across the street. She wants to chase them, but will probably never catch up to one. 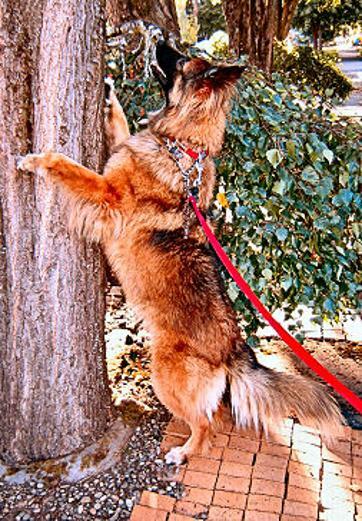 And really, she is only frustrated if she cannot end up in this position -- standing at a tree trunk, looking up at where they went! Notice her excellent posture, by the way. ....The above photo was taken earlier in the summer. This one was taken late in September of 2015, her first year with us. Somebody looks less like a telephone pole with legs in the second picture, right? As September of 2015 began, we started to realize that Sable had actually grown a bit in the four months she had been part of our family. We got her at 51 pounds, and she will always be a bit smaller than the average German Shepherd...but she appears to us, and to others who have seen her along the way, as having grown, and filled out her girlish figure -- and that means she had to have been younger than we thought, or than anyone thought (except our vet), when we adopted her in April of 2015. Turns out she could have been as young as ten months old then! The first shelter that picked her up from the streets of Pasadena, California, thought she might be age four, and named her Grace. 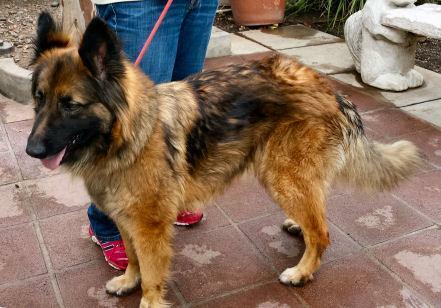 A month later, that kill shelter -- not having heard from anyone looking for her -- transferred her to the non-kill Westside German Shepherd Rescue in Los Angeles, where they thought she might then be two years old, and named her Darina von Dassow. When we brought her home in April, our vet -- Dr. Ferro, at Barclay Hills Veterinary in Oregon City -- told us, "This is a very young dog. Maybe one; possibly one and a half, but no more." So, it turns out, he was the one who got it right. We named her Sable, and she had it down almost immediately, responding to the name instinctively within two weeks. She never did respond if we called her Grace or Darina, so she was very comfortable with the name we chose. We still don't know exactly when she was born, and probably never will; based on that age 1-1/2 estimate, which was halfway between what Dr. Ferro thought she was and what Westside thought she was, we decided to celebrate her second birthday on October 21, and expect to stick with that "birthdate" for the rest of her life. But, we now know we are probably always going to be somewhat early in that celebration. On Saturday, September 5, we put Sable on the vet's scale again and found she by then weighed 61 pounds -- and it wouldn't surprise us to find her eventually near 65, or even a little more (Drew topped out at 75). But it appeared to us, from such subtle indicators as the size of her paws, that by then she was very close to her full size. 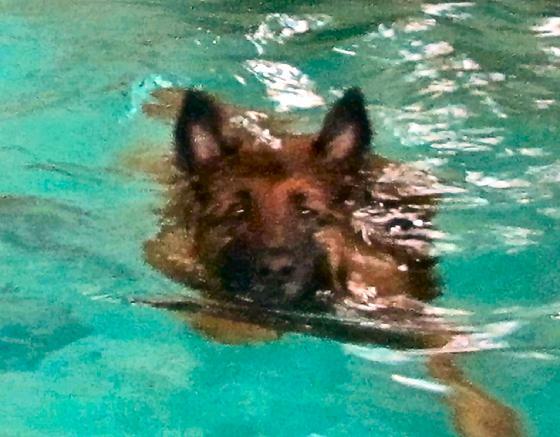 Her weekly swimming has added real muscle; she's still without an ounce of fat on her. By September she had also matured quite a bit in attitude in the intervening four months; she no longer barked at most dogs, and no longer barked at all cats, although she still kept a close eye on both...but she still went nuts about squirrels. That may not change. 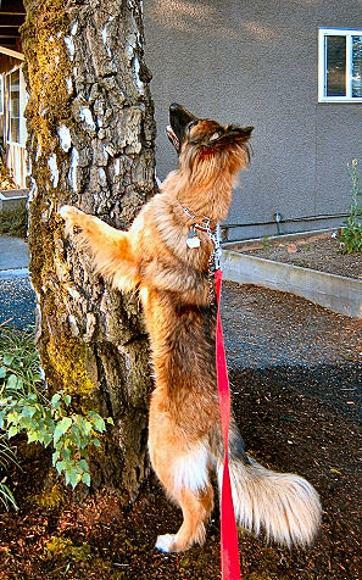 Drew never looked up; Sable is always looking up: There might be squirrels! SABLE'S FIRST BIRTHDAY PARTY IN OREGON! Although celebrating a birthday for Sable is a bit confusing, since she was estimated at 2 when we adopted her in April, was estimated (correctly, as it turns out) by her vet as more like 1 then, and thus making her 1-1/2 on her arbitrary second birthday on October 21 -- we went ahead with a birthday party at the Brooklyn House (click on the lower photo to access their website), and added to the confusion by celebrating it on Saturday, October 24. It was a combined party with John and Hsiou Lien from Corvalis, who brought their Gwendee, a Long Haired German Shepherd who had just turned 12. Presents were exchanged in our leisurely 3-hour dinner, which included a fine dinner for the dogs, topped off with custom little birthday cakes, which both pooches consumed with gusto. "Uh oh....my dessert is on fire!!" 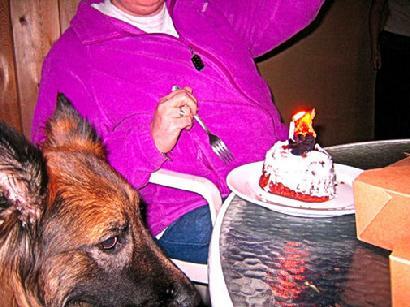 The blaze extinguished, Sable savored her special birthday cake -- organic ingredients, frosted with porkfat, with a sprig of bacon on top! ...And after the party, she slept very well! AND ON THE THIRD DAY IT SNOWED. 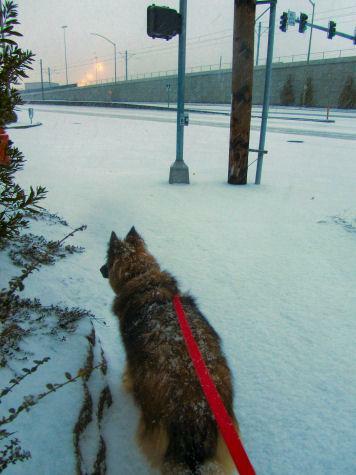 On January 3rd, 2016, one of Portland's rare snowfalls crept up on the city, and Sable encountered what was probably her first snow. It took her about two minutes amidst the falling flakes to decide she liked it, and then she frolicked around her usual ten-block morning route. Here, she contemplated McLoughlin Boulevard -- State Highway 99E -- without much traffic on it. She did keep an eye out for squirrels, but there were few to be seen. JUST HANGING OUT. Now that Sable has gotten thoroughly acclimated to her crate in the kitchen, she never uses the back portion -- for whatever reason, she curls up in the front part, and her head sticks out. Sometimes, all the way out -- so she's sleeping with her nose on the floor. Looks very uncomfortable. 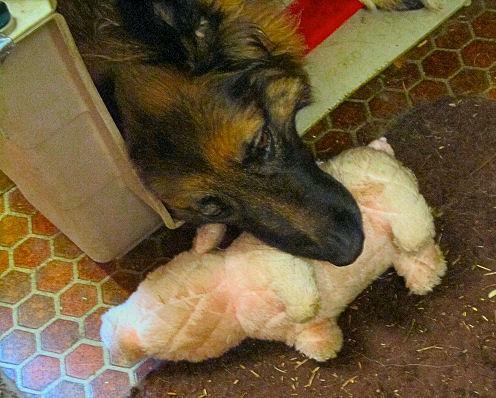 But, as shown here, Jane has found that if you place a plush toy there, she will use it as a pillow! Sable's a really strong, competitive swimmer! Sable enjoyed her fortieth weekly swim at Paws Aquatics on Tuesday evening, March 29, 2016. She quickly became a strong swimmer after she began the swim therapy, and in playing games in the pool with her trainer and with our friend Mike Sullivan, she has proven smart and competitive -- with very fast reflexes! 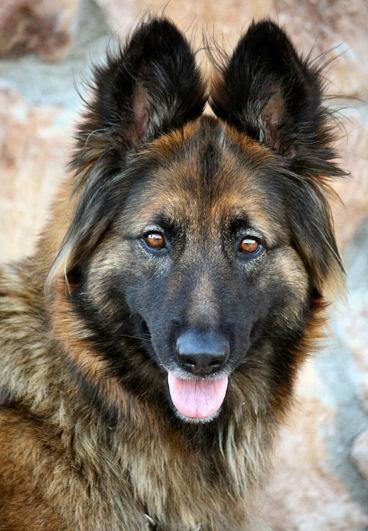 She has built muscle and balanced her body well, eliminating the muscular imbalances that resulted from her tendency to favor her damaged left front paw. Above is an action shot, taken on March 22, as she churned towards the camera to retrieve one of her squeaky toys, which had been tossed the length of the pool for her to beat Mike to, and retrieve! All this swimming has done her endless good, and it is a high point for her of each week -- but it has had the unfortunate side effect of developing large, intractable, and uncomfortable hair mats all over her body. We have never had a dog develop hair mats so we didn't see this coming. When we realized the problem we acquired a variety of grooming tools and started using them, but it was too late to get rid of large hair mats already tight against her skin. Two groomers and her vet said she must be shaved. We eventually realized there was no alternative, and on Wednesday, March 30, 2016, at a true age probably approaching two years of age, she spent a few hours with a skilled groomer and emerged . . . well, not really recognizeable! 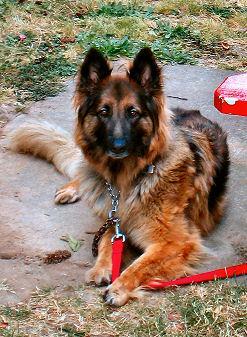 Turns out the coloring of German Shepherds, and their various types of coat, help us to recognize the breed instantly. Without the coat, it's a bit harder! Sable cooperated throughout the shearing, and certainly enjoys not having the hair pinching all over her body now, but we are hoping we can deal effectively with her coat as it regrows after each swim, and prevent or eliminate any matting before or as it starts, so we won't have to give her a haircut like this again. OKAY. So you want to see what Ms. Sable looks like, au natural...? As a public service -- so you will be prepared, if you have to do the same sometime -- we should show you.